The Surge Its Fitbit “super watch” and has a watch outlook more than a sleek fitness tracker like The Flex 2 or Alta models. Along with 8 different sensors like the MEMS 3-axis accelerometer that can read motion patterns to calculate your steps taken, calories burned, active minutes and distance traveled. As well the GPS and Heart Rate functions. For a full Review and Comparison of all the Fitbits models check the links. The surge excels when it comes to tracking workouts and exercises, the tracker comes with a larger LCD display that gives you access to all your stats and notification on your wrist, and it’s able to easily cycle through multiple stats. The Surge is available in 3 different colors Black, Blue and Tangerine. The face of the tracker is more like a sports watch that would look good in the gym, or when you’re out for a run, but not so much with a shirt and tie. There’s a very secure buckle in evidence, and it won’t come loose no matter how active you are. There are three watch straps sizes ranging from small (14-16cm), large (16-20cm), x-large (20-23cm), so there’s a fit for pretty much for most. We found it comfortable and secure to wear thanks to the watch-style metal buckle. The side of the tracker has a sloping body that is where the GPS sensor is positioned, although this doesn’t affect the fit of the tracker in any way. The biggest new feature to get used to is having a nice big touchscreen display to view your data. The Fitbit models with the exception of the Zip, Blaze and now the Ionic include a smaller screen, making the 1.26-inch touchscreen display that comes with the Surge a pretty cool addition for those that would like to get their entire notifications on their wrist instead of checking on the phone. You have also physical buttons that you can use for extra control to set everything on your watch, like workout timers, music controls as well GPS tracking. The display is not in color and doesn’t fit as much information on one screen like the Fitbit Ionic, but now there’s no need to cycle through by pressing a single, tiny button. Besides having a GPS to track your movement in the most accurate way, the Fitbit Surge comes with an optical heart-rate monitor that tracks your heartbeat all the time with the PurePulse function. The tracker will measure and log your heart rate constantly throughout the day. In fact, the Surge will capture your heart rate every five seconds during normal usage, and every second if you’re exercising, which should be enough for all but the most data-driven of fitness fanatics. The steps you take throughout the day are logged, as is every flight of stairs you climb. The Surge will use the data it gathers to also estimate the distance you’ve traveled and the calories you’ve burned. Like all Fitbit devices, the Surge will discern between a gentle stroll and a power-walk, logging ‘active minutes’ when you’re pushing yourself a little harder. But where the Surge really differs from other Fitbit devices is in its ability to track actual training and exercise sessions. With GPS functionality built into it, the Surge can measure your speed, distance, and pace over time as you train. So, if you’re a regular runner or cyclist, you can use the Surge to track all your training sessions, negating the need for a dedicated running watch or bike computer. Double tapping the left button brings up a hidden menu for interfacing with your phone’s music. The surge comes with smartphone and web app support so you can sync data over Bluetooth 4.0 or use the supplied USB Bluetooth dongle to do it via your Mac or PC. The tracker support Android, iOS and Windows and these apps are consistent across all platforms – so if you switch between a few different platforms, it won’t feel like a jarring unfamiliar experience. Its brilliance is in the simplicity. When you access the dashboard you will found a breakdown of data categories that will include your resting heart rate and logged runs as well you regular activity tracking. That’s enough to give you a nice summary of your day’s activity. If you want to go more in-depth, then you can delve deeper by tapping on the different categories. In the heart rate section, you can get a report of your resting heart rate over the last months and the app will compare your data with other people that are at your same fitness level and age, giving you a perspective of your overall health. For logging runs, there’s plenty of useful data here as well. Breaking down the activity into a calendar, you can click on an individual run to see your journey mapped out, a record of split times, a break down of heart rate zones and calories burned. The Impact section does a nice job of separating that data from regular step counting giving you a better idea of how much those running sessions are contributing to your daily total. If you access the Devices section, you are going to be able to modificate your data syncing frequency, choose your wrist placement to ensure data is accurate and pick from four different watch displays. The Surge model is an impressive tracker with a lot of advanced features, but it falls behind compared with high-end trackers when it comes to battery life. Something that maybe we can expect from his large black-and-white LCD and new GPS capabilities. So when you are expecting a “super watch” that can last 7 days with heart rate monitoring and activity tracking enabled but they advise you to turn off GPS and music controls there is something wrong. We test the Surge to see if at least the claim for 7 days was enough. But when we tested on workout tracking, the tracker was without juice after 5 days of use. Then we take the tracker for one hour of run every day and after 4 days the Surge was without battery. It is true that not everyone will use the tracker to workout 5 days in a row or go daily for a run there’s definitely other sports watches that can offer better battery performance. The Fitbit Surge was created for those that would like a reliable tracker for workouts and runs. In comparison with other Fitbit models like the Fitbit Flex or Alta, the Surge excels thanks to GPS-mapped runs, basic music controls, and smartwatch notifications. The real conflict that we have with the Surge is that for a tracker that is meant to be a watch to use every time of your day and NIGHT you are not going to be comfortable to go out with a watch that looks so robust. When it comes to size there other more sleek models that can be wear in different occasions. That’s the price of having a built-in GPS, a touchscreen interface, a heart-rate monitor and automatic sleep tracking all in the same package. The Surge was made to fill the void between a fitness tracker and a real running watch. Is no more than that, when you would like a tracker for your runs and you don’t wanna spend $500+ on a Garmin this is the one to go. 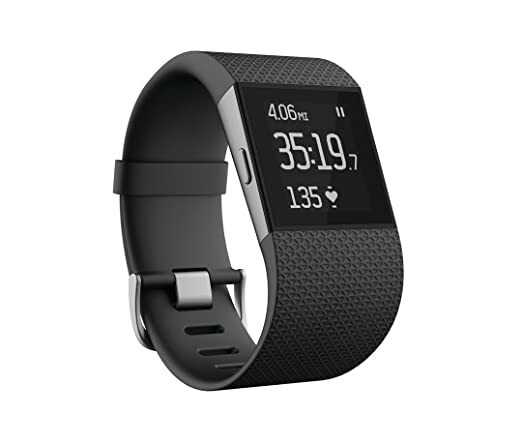 The Fitbit Surge is a heart-rate monitor and activity tracker with all the bells and whistles for the serious sports and fitness enthusiast.The only GPS-capable Fitbit tah is a great fit for casual runners, but more serious athletes should look elsewhere.